When this show opened on Broadway in 1951 it didn’t find its audience and closed after 102 performances, leaving behind an interesting score. It’s true this isn’t the best score of the 50s, far from it, but Hugh Martin’s work is highly pleasant and it deserves to be discovered. It also remind us that on that time even lesser shows come up with better scores than most of the Broadway musicals of today. Just listen at Nanette Fabray (at the top of her form) having a great time with “I Wanna Be Good ‘N’ Bad” and you’ll see what I mean; today no one writes songs like this one. 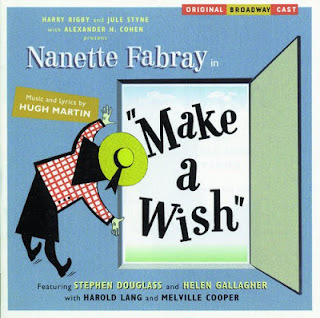 Besides Fabray, the cast includes Stephen Douglass, Helen Gallagher and Harold Lang, and all of them sound like they were having a real good time recording this score and with songs like “Who Gives a Sou?”, “Over and Over”, “That Face” and the delightful title number, so will you. I know that Hugh Martin also wrote MEET ME IN ST. LOUIS, but I think some of his best work is here and I strongly recommend this cast recording. This CD also have bonus tracks by Stephen Douglass singing songs like “Long Ago and Far Away”, “She Didn’t Say Yes” and “They Didn’t Believe Me” among others.